I also love french toast. 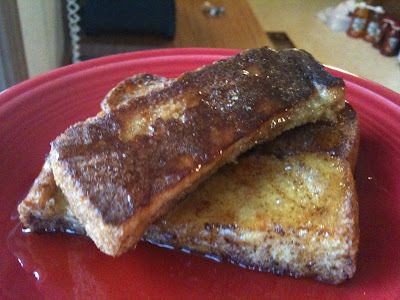 I never make french toast, but I love it. I actually just never think to make it. We only ever make breakfast on the weekends when my husband is home. If its just me and the baby I try to eat something quick like a bowl of cereal or a banana after I feed her. So when I found this recipe it just called out to me. It was french toast I could make ahead of time and microwave in 1 minute! This is my adaptation of that recipe. 4. Melt margarine. Slowly whisk into the egg mixture. If you dump it in the hot butter might cook the eggs so go slow. To eat fresh from the oven: Put on a plate, drizzle with syrup, enjoy! To freeze: Allow to cool. Flash freeze sticks on cookie sheet. When they are hard transfer to large freezer bag. I ate 5 right out of the oven! They are so good I couldnt resist. Plus my house smelled like french toast for hours. Yum!